Johann Eitel, Weilburg, circa 1780. Heavy octagonal barrel with seven-groove rifling in caliber 14 mm, dovetailed iron sight. Four brass-filled marks on the breech. 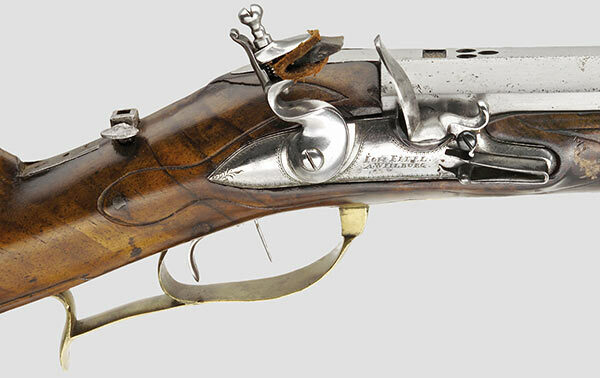 Lightly engraved flintlock with set trigger, the cambered lockplate signed "Ioh. Eitel a Weilburg". Lightly carved full stock with patch box, bone nose-cap and iron socket for a peep-sight. Smooth brass furniture, the wooden ramrod with a horn jag. Length: 127.5 cm. Johann Eitel, Weilburg/Hessia, circa 1780-1820, the princes of Weilburg-Nassau were among his clients.